The Eden Prophecy by Graham Brown, a Mysterious Review. Review: In southern Iran in 1979, archeologists Ahmad Bashir and Peter McKenzie discover a copper scroll not unlike that which was found among the famous Dead Sea Scrolls. Bashir believes this scroll could be seven thousand years old, but whatever secrets it may hold, they are lost as quickly as they were found as a sudden storm sweeps the scroll from Bashir's hand and within minutes it disappears beneath the vastness of the desert sand. So begins the thriller The Eden Prophecy by Graham Brown. The scroll is eventually found again, and is believed to contain information on the location of the Garden of Eden and thus knowledge of life itself. That information is beyond value to some, for it can be used for the benefit of all mankind … or it can be used to destroy it. In the present day, a new virus has been identified, one that defies explanation of how it works. It doesn't necessarily kill — though it seems perfectly capable of doing so — yet paradoxically seems to have unusual curative properties. Its source is traced to Ranga Milan, a geneticist in Paris, who denies knowledge of it. Regardless, he realizes he is in danger, and Milan reaches out to a man known only as Hawker, a once rising star in the CIA, now a mercenary for hire. Hawker travels to France but is too late; Milan is dead. Hawker does find, however, an American investigating Milan, Danielle Laidlaw, an operative with the National Research Institute, a hybrid government organization that functioned like the CIA but in the world of industrial secrets. Together, they set off to identify who killed Milan, which they hope will lead them to the true source of the virus. 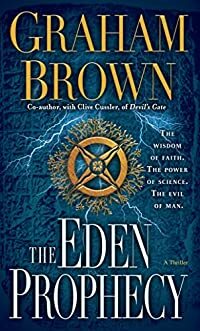 The Eden Prophecy is an action-packed thriller, filled with scientific intrigue, well developed characters — notably Hawker, a man unable to escape his past but determined to make up for it; and Drako, an intelligent but supremely evil villain — and an ambitious storyline that maintains a measure of credibility throughout even though much of what happens is indeed incredible … but in a good way. Special thanks to guest reviewer Betty of The Betz Review for contributing her review of The Eden Prophecy. Acknowledgment: Random House provided a copy of The Eden Prophecy for this review.